The Alliance believes that advances in research help people live longer, happier, more productive lives and reduce health care costs over the long term and that access to the latest scientific information empowers people to take control of their health. The Alliance strives to advance science and enhance lives through a variety of activities and initiatives—from policy issues to provider and consumer health programs—that generate knowledge and action on age-related issues. Since 1986, federal support for aging research has more than tripled, private research and development in aging-related health has reached an all-time high, and new discoveries are making a lasting difference to the lives of millions of Americans. 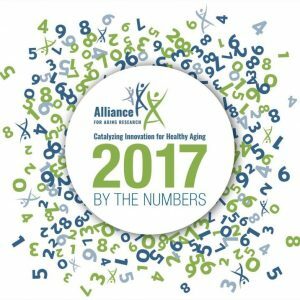 The Alliance for Aging Research is proud to share with you our report, 2017 Alliance By the Numbers.